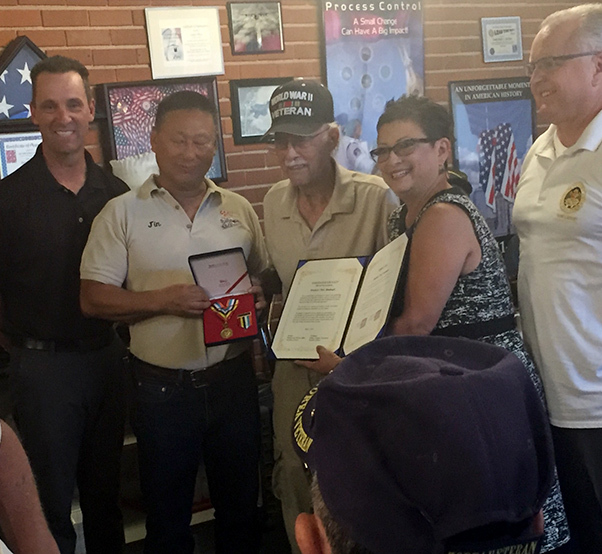 From left: Rep. Steve Knight, Crazy Otto’s owner Jin Hur and Knight aide Christine Ward present Korean government honors to World War II-Korean veteran Woodrow “Pete” Randooph as Assemblyman Tom Lackey joins in the recognition. LANCASTER, Calif.–A weekly gathering of veterans at a much-loved local diner, with the improbable name Crazy Otto’s, functions as a kind of living history tableau. 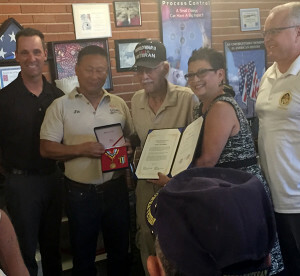 Several times a year, the congressman who represents most of the Antelope Valley, Rep. Steve Knight, also a member of the House Armed Services Committee, turns up to preside at awards of overdue medals and decorations. A recent honoree is local veteran Woodrow “Pete” Randooph. At 90, Randooph is one of the youngest of the surviving “Greatest Generation” veterans of World War II. Randooph is even more of a rarity these days. If you were 17 at the end of history’s greatest conflict, you are on top of 90 years, right about … now. Knight; his veterans aide, Christine Ward, and Crazy Otto’s proprieter Jin Hur invited Randooph in to be honored with a medal from the government of South Korea. They were joined at the event by Assemblyman Tom Lackey, R-Palmdale, a career first-responder. Randooph served during World War II and also during the Korean War. The Merchant Marine was militarized during the war, and early in America’s part of the war, just after Pearl Harbor, it was Merchant Marine mariners who suffered higher casualties than air crew and infantry. Ships were sunk by submarines, by mines and by aerial attack. “I was in the Atlantic and the Pacific, and when the war ended, I was still very young,” Randooph said. He did whatever he could to get into the service, because he had a brother who was in the Army and stationed on Oahu when the Dec. 7, 1941 attack on Pearl Harbor happened. “I had a great-uncle who was first sergeant with Teddy Roosevelt at San Juan Hill,” Randooph said. As it goes with many in the military community, there are inter-generational families in service. Randooph’s, brother, father and great uncle modeled that tradition. That is also the tradition in the Knight family. Rep. Steve Knight, R-Antelope Valley, served in the Army with an armored unit during the Cold War in Germany. Knight’s father, the late state Sen. William J. “Pete” Knight, graduated the military academy and entered service during the Korean War. He became one of the generation of “Right Stuff” test pilots for the Air Force, along with Chuck Yeager and Buzz Aldrin. On completion of his world-record setting speed in the X-15 rocket plane (a record that stands today), Major Knight volunteered for immediate assignment during the Vietnam War and flew 256 combat missions. Performing the ceremony to award overdue medals and decorations is an honor, Congressman Knight said. At the recent breakfast, in addition to a congressional recognition for the 90-year old Randooph, Knight awarded service and overseas medals to Kenneth Felton, an outreach worker with Mental Health America’s Military Resource Center, which combats veteran homelessness. Also recognized was John T. Smith, a veteran of both Air Force and Navy service. Assisting Knight with the recognition was Ward, who works at the congressman’s Palmdale field office. “I just want to urge all veterans, that if you have problems with the VA, if you need your records updated, or if you just need help with something, please get in touch with us,” Knight said. The Coffee4Veterans gathering happens on Tuesday mornings at 7 a.m., and usually runs until 9 a.m. at the Crazy Otto’s diner and restaurant on Avenue I in Lancaster. The gathering is informal, with no rules except to be polite to speakers and guests, many of whom make appearances with information that can be helpful to veterans. Veterans of periods of service and wars ranging from World War II to the current post-9/11 conflicts in Iraq and Afghanistan frequent the gathering, which usually takes place in a packed house in the back section of the restaurant. Restaurauteur Jin Hur has been a frequent booster and supporter of veterans causes. He attributes this to the role that Americans played in defending his native South Korea during the Korean War, 1950-53. “My family enjoys its freedoms because of what America did in defending South Korea,” Hur said. Hur’s son, Richard, served with the 3rd Bn., 5th Marine Regiment in Afghanistan, and another son recently became a Sacramento police officer, so the family has a history of service. For veterans who have a busy Tuesday schedule, there is a Veterans Coffee hosted by the Antelope Valley Veterans Community Action Coalition. It is hosted by Vietnam Veteran and Coalition President Dean Brown at Birdie’s Restaurant on 10th Street West, Wednesday mornings at 8 a.m. The breakfast is also visited by veterans service representatives and elected officials.